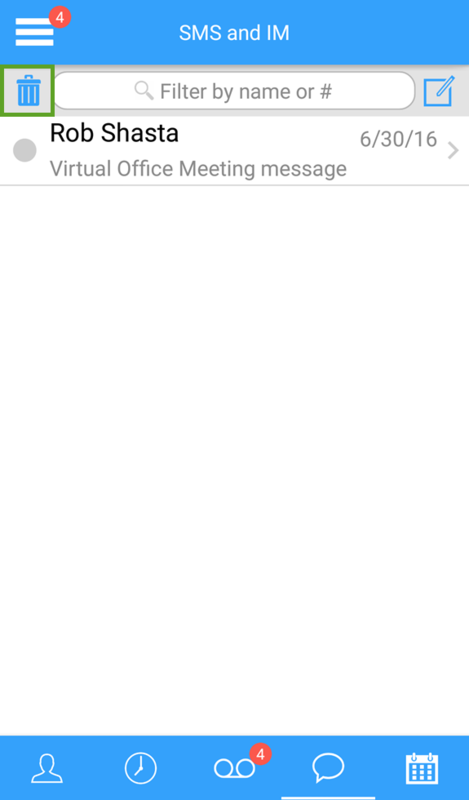 From the SMS and IM screen, you can access and manage your personal message history. You can search for an SMS or IM by contact name or number. You can also open a recent message via notification. From the main menu, select SMS and IM. The SMS and IM page opens, listing the name and presence of contacts you have previously sent or received messages from. Search the contact name or number, or scroll through the list. Tap the desired message to view the transcript. If your phone system administrator has enabled it, you can delete messages from your personal history. This does not affect the message history of other users. Select the check box of the SMS or IM to be deleted. Accept the prompt to delete the selected messages.